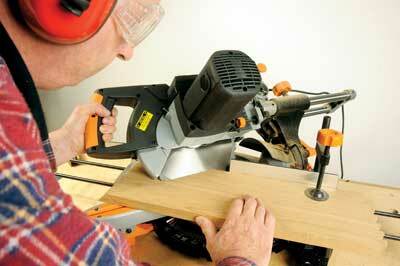 One of the most useful machines on site or in the workshop has to be the sliding compound mitre saw. Evolution have their own particular swing on this - saws that cut anything! At the 0° setting the crosscut distance is 300mm x 75mm high while at 45/45° compound it is 210 x 40mm. Those are the key figures but see the specification opposite. It can also be set to make crown moulding cuts as well. There is an adjustable laser module to aid precise repetition cutting and extended work supports and top and front work clamps. What makes Rage3 machines different is actually the blades and the machine's ability to work with those blades. You want to cut wood accurately? No problem. Try a steel box section - again, no problem. With quick, accurate cool cutting and virtually no burring or sparks, it is safe to use and the workpieces safe to handle after sawing. The saw head is fixed so it acts as a chopsaw when metal cutting. 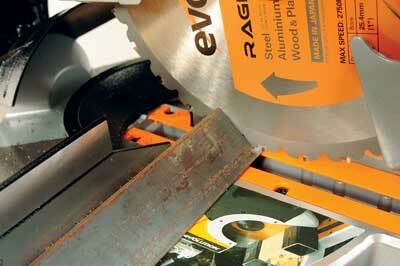 This makes these saws ideal for site work, especially for refurbishment and recycling timbers without always dealing with tedious nail removal - just trim to a clean finish. There is also an accessory workstand for all Rage mitre saws so you can have a long work support if you need it. I nearly forgot to mention that by fitting a Rage Diamond blade, you can then cut tile, ceramic, limestone, marble, natural stone, porcelain and slate. Perfect for installation work. What's not to like?